We have been busy as always at Nautical Monkey HQ trying our best to keep up with your growing list of feature requests. The latest round of changes was inspired by a group of users who needed to be able to create nonstandard time slots in their scheduler. Create any configuration that works for your sharing scheme. The typical scenario was a 10am to 6pm day slot and a 7pm to 9am overnight slot. 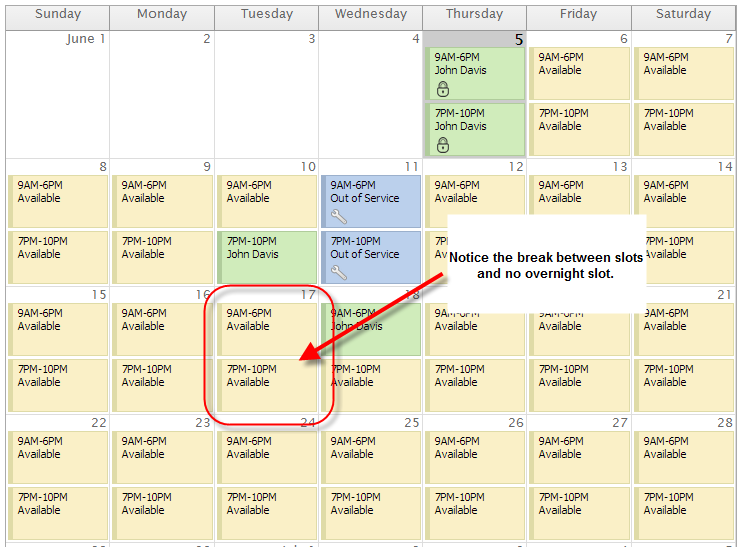 Because our scheduler was designed with the concept of equal slot times, this was impossible. But, because we love you, we just completed the ability to add custom time slots. You can set any configuration you need and can also have breaks between the slots to give people some prep time. 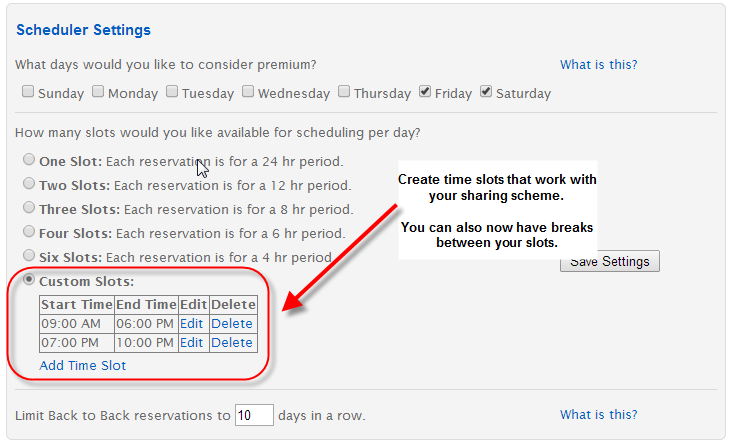 As you can see in the example configuration, you can completely leave out times that your members don’t use under your typical sharing scheme. In this example, I have a 9am to 6pm day slot and a 7pm to 10pm evening slot but no overnight slot. You have complete flexibility to create a scheme that works for you. You have complete flexibility with the new scheduler to create whatever scheme will work best with your partners and members. Please Note: If you change your slot configuration, all future reservations will be cancelled. All your members will be notified via email and can go back in and re-book their reservations. We also implemented a function that allows administrators to limit how far in the future members can make reservations on the boat. At the bottom of the Scheduler Settings page, you will now see a section which allows you to set how far into the future members can make reservations. Hand in hand with that change is a function that allows you to set the max number of reservations a member can make in a particular time period. 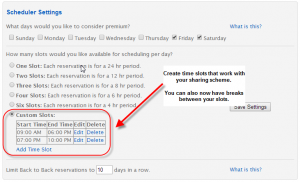 This works along side the member’s share percentage to prevent a member from making too many reservations in a particular time period. Well that’s it for now – as always, send us an email at support@nauticalmonkey.com if you have any other feature requests or see any problems we need to fix. 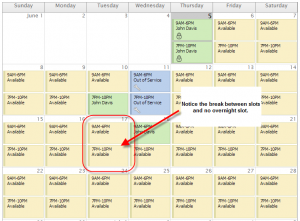 Nautical Monkey Newsletter – Scheduler 2.0 Released! 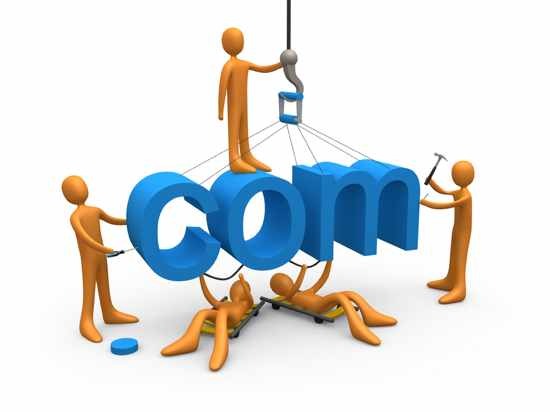 We already have a boat syndicate established with 12 members, Web based, ability to book maintenance and deliveries. members are restricted to 7 days per 3 months (per season is winter spring). 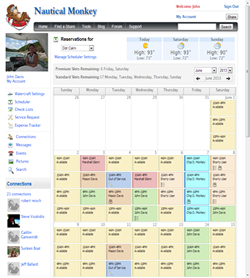 Admin can book addition days for the members. Can the scheduling software do this? how much is it per month ? Why do you need A url below????? You should be able to accomplish that within the system – while the system limits booking per member on a monthly basis, there is a setting to allow members to “borrow” slots from previous and future months – which should give you what you need. The best way to make the determination is to sign up for a free account and play around with the scheduler settings. There are so many different paradigms that people use, that we set things up with a large amount of flexibility – in some ways that makes things a little harder to set up and you have to play around with setting quit a bit to get what you want – but in the end, it was the only way to deal with the various complexities. Let me know if you have any other questions – you can email me directly at jdavis@nauticalmonkey.com.